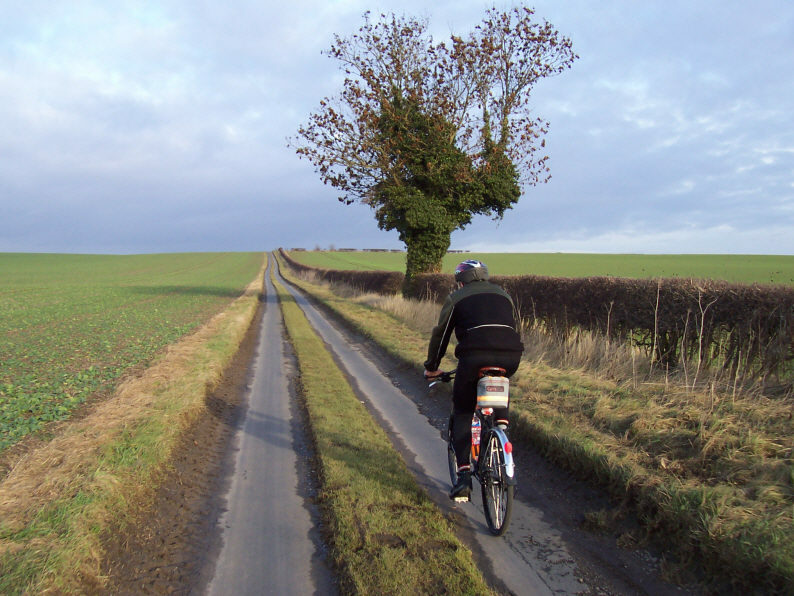 Not a day for many photo opportunities, although I hope to write something about the ride I did today which included the Driffield Big Skies Bike Ride – or at least the majority of that route. Before the rain came down I took the photograph below of half of today's 'B' group riders, cycling along the NCN route 1 in the Yorkshire Wolds at a place called Bracken. Our ride to the cafe stop at Bell Mills near Driffield was exactly the same as my first ride with the CTC after a break of nearly 20 years. That day, back in October 2009, was the start of my little tour of the North York Moors and Yorkshire Dales. Not so far today, but it felt like it. Tom on his winter mountain bike. He has thinnish tyres as a concession to road riding. So just two of us today. I was out with one of the strongest riders, Tom. Mercifully, he rides one of his mountain bikes when he's out with us (he has six other bikes). That helps to slow him down. A bit. He'll be 60 in August. I hope he doesn't treat himself to a fast bike for his birthday. Posted by Chris on January 16th, 2011. Very nice picture Chris, and well done with the mileage. 76 day-miles in a soggy winter is impressive. Some better weather coming up this week though. Yes, cracking picture and 76 miles is certainly much further than I've cycled for several months. Its supposed to be sunny tomorrow, which is some consolation as the rain beats against the window! There is something rather satisfying about that broad strip of grass in the middle of the single-track road, a gentle rise to the point where NCN route 1 becomes part of the Way of the Roses C2C ride (that I may have mentioned once or twice before). I do like that funky tree, too.